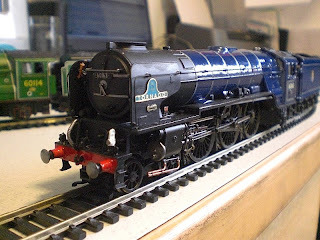 THE BRITISH RAILWAY STORIES LTD: "Projects on the go"
Modelling wise, there have been a least three projects at any one time I have been working on for Copley Hill. Now finished externally, with the cab roof painted cream, "named by" plaques fitted and an A4 chime whistle attached to the inside of the smoke deflector. The next modifications to be made are going to be things like a high intensity light and a smoke unit. I am just awaiting transfers for the cab and tender, and for a nameplate manufacturer to get back to me with a quote for 8009's plates. Then it will be finished! I was almost at the last hurdle with Great Northern...and then some problems with the footplate (again) reared their head. 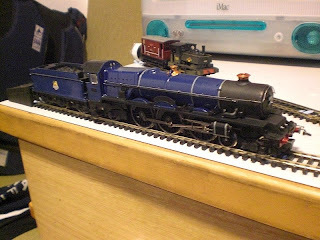 I have two options - leave it, and fit the valve gear - or take it apart and rebuild it so that it becomes more than it is. I have already decided on option two, but it will have to wait. 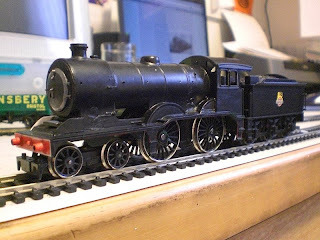 I am going to do a small job on the valve gear, which is fitting a scrap set of Brittania valve gear for the moment. 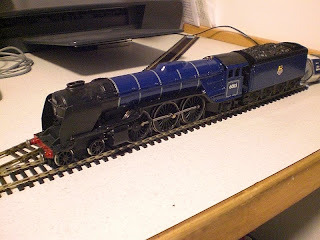 The locomotive is required for filming an episode of The British Railway Series at Easter, and as such needs to be able to run reasonably, and look reasonable for that. After that, I will dismantle it for rebuilding - and get my vision of an "A1/1 from an A1" finished. Many thanks to Tony Gee for the copies of some Isinglass A1/1 drawings which will help immensely with the rebuild. That's my first update for March. Let's hope by the end of March, I get at least one of these projects finished! "From a B12 to a D16..."